I have some ethers in a Geth wallet that I'm trying to transfer to an exchange, but the problem I have is fast sync is downloading 1 or 2 blocks every 10 to 15 seconds and I'm only up to 4,225,189. Basically, it's running so slow on an SSD and 100MBps internet connection that I cannot ever sync I tried to transfer the ethers and got a response hash message, but the ethers never ended up on the exchange. I assume I need a fully synced Geth to transfer anything out of it? That's completely impossible to achieve. 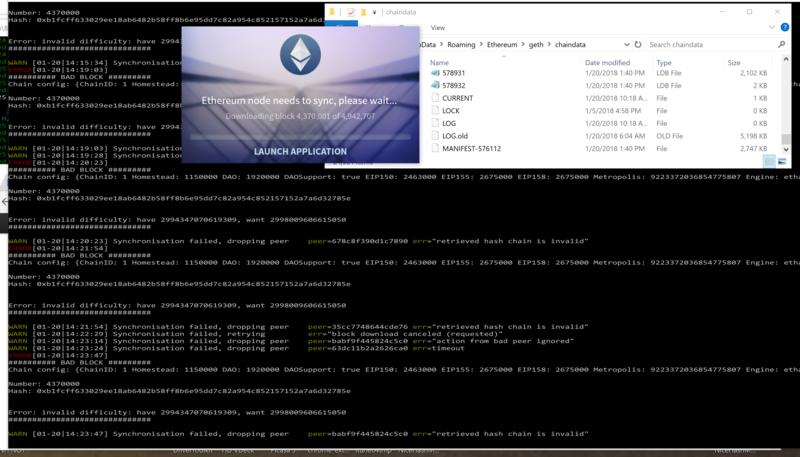 Is it possible to somehow move the ethers to another Ethereum client by way of the private key? yes i have the same problem as you. I also tried to sync the last 0.01% of the chain but it seems impossible. So i go to myetherwallet and loaded my wallet file into the site and entered my password. You can also enter your private key on https://www.myetherwallet.com/ . After that i can send the ether to other adresses. This is is a huge Problem in ethereum. Restart geth --fast --cache 2048 from 0 blocks months ago state entries have stopped now help please would like the whole blockchain ! I have the same issue too. I see progress but it's very slow. Been a few weeks. Had to run with --fast and --cache 1024. I should have allocated more ram for that VM so I can use a high cache maybe it would have helped? I wonder if the problem is that not enough people are running full nodes. For the protocol to work there needs to be enough nodes where they actually do the port forward and all that. Most people are probably not doing that. Even miners are mostly mining to a pool so they won't necessarily be acting as a node. Anyone know if geth can be made to work on CentOS? All the tutorials are for Debian/Ubuntu. I'd be willing to setup another node on my web server too. If ever I actually do get it to sync I will make it available as a download. I have an unlimited bandwidth plan on that server.